Gov. Andrew M. Cuomo outlined a reform plan for the criminal justice system Sunday, beginning with preventive programs in schools and including post-prison apprenticeships to “stop this cycle” of incarceration disproportionately affecting young black and Hispanic men. 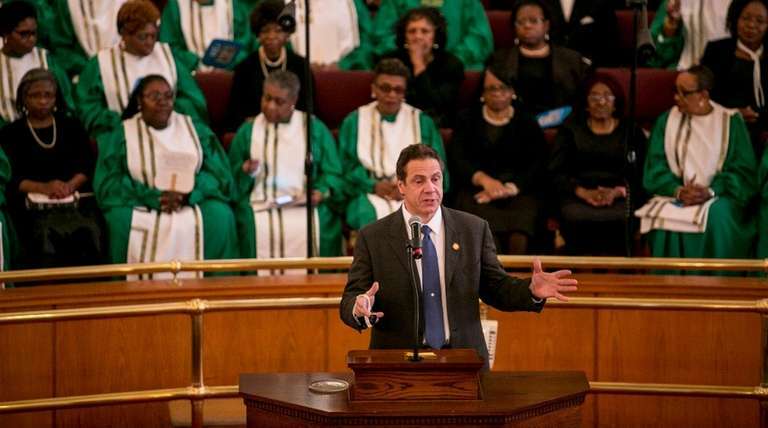 The Democratic governor, speaking before a receptive audience at Mount Neboh Baptist Church in Harlem, previewed an initiative to be announced in his State of the State speech on Wednesday. “It’s wrong to put people in cages like animals and waste young lives,” the governor told reporters afterward. The proposals were part of a seven-point Cuomo plan making criminal justice reform a priority in Albany. Cuomo had more than a dozen local, state and federal elected officials standing with him, including Rep. Charles Rangel (D-Manhattan), state Sen. Adriano Espaillat (D-Manhattan) and City Comptroller Scott Stringer. Mayor Bill de Blasio was not among them.